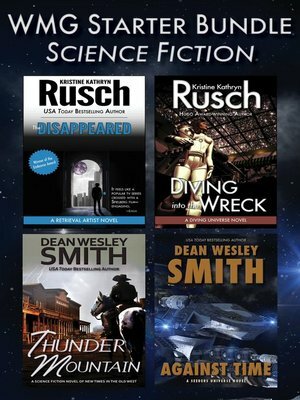 Find your next science fiction adventure from WMG Publishing in this four-book bundle containing the first book in some of the best sf series being written today.Meet Miles Flint—called one of "the top ten greatest science fiction detectives of all time" by io9—from Hugo Award-winning Kristine Kathryn Rusch's Retrieval Artist series. Gear up for page-turning space adventure in Rusch's Diving series. Get ready to travel in time to the Old West with USA Today bestselling author Dean Wesley Smith's Thunder Mountain series. And prepare to unravel the mysteries of the human race in Smith's Seeders Universe.This starter bundle includes: The Disappeared, Diving into the Wreck, Thunder Mountain, and Against Time.The DisappearedIn a universe where humans and aliens have formed a loose government called the Earth Alliance, treaties guarantee that humans are subject to alien laws when on alien soil. But alien laws often make no sense, and the punishments vary from loss of life to loss of a first-born child.Now three cases have collided: a stolen spaceyacht filled with dead bodies, two kidnapped human children, and a human woman on the run, trying to Disappear to avoid alien prosecution. Flint must enforce the law—giving the children to aliens, solving the murders, and arresting the woman for trying to save her own life. But how is a man supposed to enforce laws that are unjust? How can he sacrifice innocents to a system he's not sure he believes in? How can Miles Flint do the right thing in a universe where the right thing is very, very wrong?This Endeavor Award-winning novel is Flint's first adventure, the story that turns him from a police detective in the Armstrong Dome on the Moon into a Retrieval Artist.Diving into the WreckBoss dives derelict space vessels, for money, yes, but more for their historical value. So, when Boss uncovers the find of a lifetime, she enlists the best divers she can convince to help her pursue it—off the grid and under the Empire's radar.Boss' discovery leads her and some of her team to the Room of Lost Souls. Boss remembers the Room. It haunts her. Her mother died there. Now, a client wants her to go back. She wants Boss to help her uncover the Room's mysteries. But the truths she discovers might destroy everything Boss holds sacred.Because the more they discover, the less they realize they know—and the more it will cost them all.Thunder MountainUSA Today bestselling author Dean Wesley Smith weaves a science fiction tale of love and survival of two modern professors dealing with the past.Offered a free trip into a remote Idaho wilderness that she loves and studies, Professor Dawn Edwards can't refuse. On the trip she meets Professor Madison Rogers, and they fall for each other before they even reach their destination.But living in the Old West proves to be a brutal task. Somehow, Dawn must survive to rescue herself, her friends, and the man she loves.A science fiction novel of new times in the Old West.Against TimePaleontologist Callie Sheridan spent a few days deep in the Oregon Caves on a dig with three students from the University of Oregon. When they emerged, they found almost everyone in the world dead. Survival became her only thought.Mathematician and galactic explorer Vardis Fisher dropped into orbit over a planet where almost all of the human life had been recently killed for no obvious reason. Suddenly, hundreds of other ships, all human, appear in orbit and start working to save the planet's remaining population.Together, Callie and Fisher work to discover the secrets of a galaxy that has been hidden in plain sight, even from the powerful humans who rescued millions. And in the process, they just might change everything.